Desert Rim finds Jock Macdonald at the height of his artistic powers. 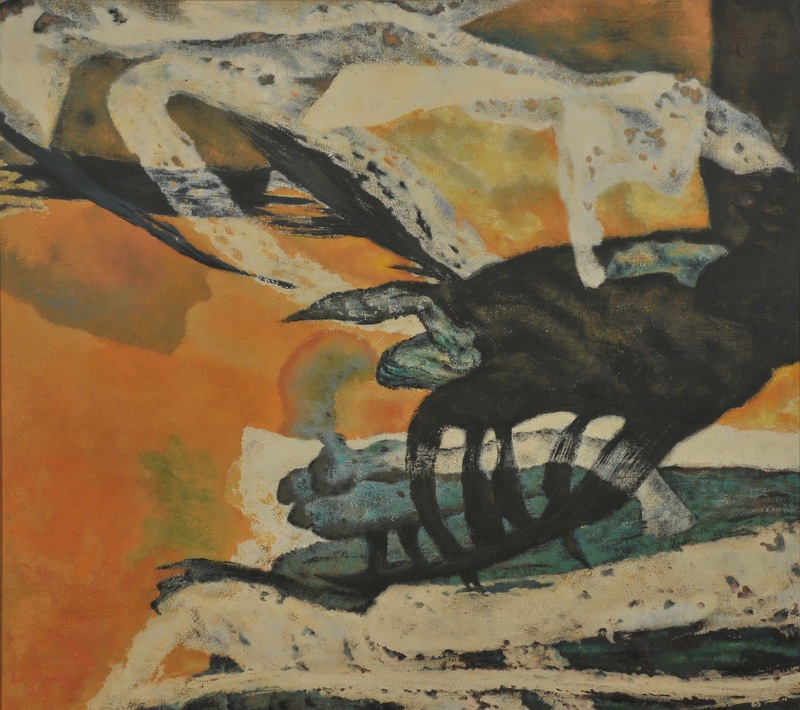 At the time, MacDonald was still a member of the Painters Eleven, a loosely formed group that included such artists as Harold Town, Alexandra Luke and Kazuo Nakamura. With Painters Eleven, Macdonald increased his profile through exhibitions across Canada and in the United States. He also gained a like-minded circle of colleagues with whom he could discuss strategies of pushing Canadian art to new frontiers. The Group disbanded in the fall of 1960, the year that Macdonald died. Scottish by birth, Jock Macdonald came to painting relatively late in life. He was trained in wood carving and textile design at the Edinburgh College of Art and, after immigrating to Canada in 1926, accepted a post as Head of Design at the Vancouver School of Decorative and Applied Arts. Only after meeting FH Varley, most famously a member of the Group of Seven, did Macdonald learn to paint in oils. Though his first canvases were representational, he became progressively abstract from about 1934-onwards, channelling his burgeoning interest in Theosophy and the writings of Wassily Kandinsky into his art. More and more, he aimed to express the spirit of nature rather than its surface forms—an aim shared by fellow Theosophist and painter Lawren Harris. Macdonald also had a lasting influence as a teacher, counting among his students sculptor Walter Redinger and painter Alexandra Luke.